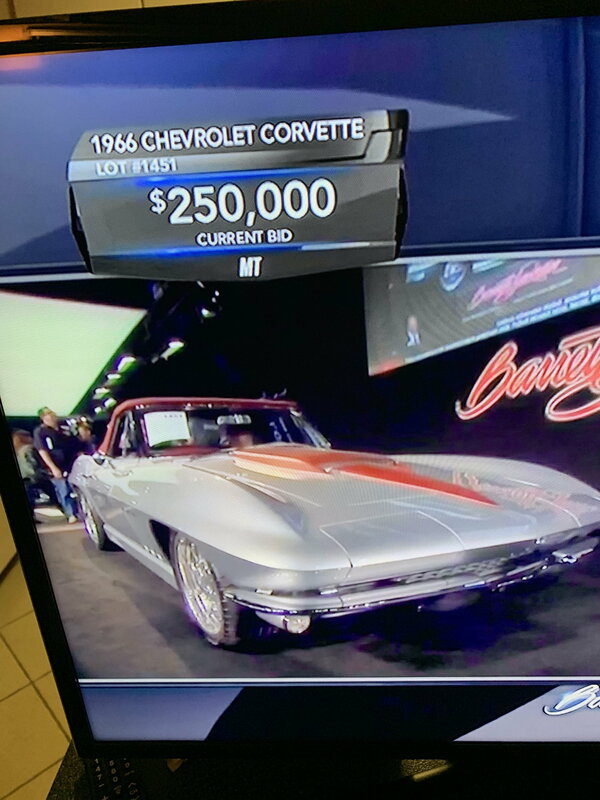 Was watching the auction on tv yesterday & I noticed that the Corvettes ( and other makes) that are resto modded were bringing the most money. The stock original models did ok, but nothing like the resto mods. A 63 split window resto went for 300k +. The moderators mentioned that the younger generation buyers don't appreciate a stock car like the baby boomers do. Are we coming to the end of an era here? The kids want a Honda/Miata/GTI,WRX more than a classic Corvette? Saw that 63 all I can say is wow that was done very nicely and yes I could see 300k for that. I agree that the younger buyers don't appreciate the older Vettes but its not them buying the $300,000 resto modded solid axles and mid years. It's older guys with money who still love the looks of the classic Vettes that want the modern engineering. They are definitely bringing more money than perfectly restored or nice, original cars. I just don't like real nice, original cars being hacked up. Basket case cars make more suitable candidtaes IMO. ...suspect the alcohol-infused bidding drives up the prices ! I saw that Vette first person. Restomods can be high dollar, done right. It's been several years now, 15 now that I think about it, that I built a 65 Mustang restomod. But, it was sold before I had it completely finished. I guess I am a spoiled brat millennial even though I am 60. I have no desire to drive the cars of my youth. Last edited by HBsurfer; 01-20-2019 at 03:12 PM. Sure. The guy with $25,000.00 in the bank is buying a $250,000.00 car on alcohol infused bidding. The people with the wherewithall to buy cars at this level aren’t doing it because they are drunk. They are doing it because they can afford to and they want a new toy. That’s how it works. This one went last night, with C7 Corvette engine! Not many millennials can afford one. Heck, I can't think many here could either. And most millennials could care less anyway. I think the restos are this year's flavor. We'll see who wants one when they get dated. Even Boyd's cars get updated or neglected. This year’s flavor is what was said 15 years ago when the restos first gained exposure at Carlisle and turned the Corvette hobby on its head. A quality resto is like a quality original car, just a different audience. There will always be a market for both. I think these auctions are a dog and pony show for investors who flip these cars at the next auction. More power to them if they got the $$$$$$! Last edited by Vet Interested; 01-20-2019 at 05:10 PM. My buddy bid on a Restomod Dodge Dart called the Poison Dart and won due to alcohol .Biggest piece of crap. $50,000 plus for a car that never ran right nor did he want. Just got caught up the moment and was intoxicated.They give you all the alcohol you can handle, drives of the bidding if you are a bidder. His action, got me on TV as I was sitting right beside him though. Used to love going and spending a week in Scottsdale. Restomods will always be popular with the ProTouring movement and there are plenty of big dollar players out there. The jets just line up along the runway during this one week as they don't have enough room to hanger them all. Last edited by c6crazy; 01-20-2019 at 05:34 PM. Meh....I would be much happier with two new Z06's, a coupe and convertible, with 100k or so left over. Are we coming to the end of an era here? With every tick of the clock, you are getting closer to pushing up daisies than you would probably like. Yes, some truth here. I know some of these guys and some of these cars rotate in and out, back and forth in their collections. In fact, I know of four cases in the last 10 or so years where the original owner sold at auction and bought his car back at future auctions. I was there yesterday and couldn’t believe how many C3s had modern Corvette engines. It was fun watching the Senna sell for $1.3 million. Meant C2s, typing too fast. A lot of truth to this. My almost 21 year old son thinks my 08 is a piece of junk because its old and the technology is outdated. Millennial kids want the next best and newest thing no matter the cost. I bet future cars are gonna be like phones. They will get updated software which will make cars slower and not work as good so you will have to buy new. Kids fall for this crap.